I am in LOVE with that Zara coat. So gorgeous! Love that coat dear, great outfit!!!! I love your coat! So cute! Perfect coat, I really love this outfit! I have that same coat from Zara and I love it! This is gorgeous! I love your coat! I love the color and your fashion forwardness. Work it! Thanks for sharing. LOVE this outfit! That cardi is amazing and so is that purse and your shoes :) So beautiful. Gorgeous look and colors! Totally in love with the tartan coat and the Orange shirt! Mi piace troppo la tua borsa Jeanne! adorable look! love the bag, it's so unique but beautiful at the same time :)) also coat is so lovely! bellissimo look, per niente scontato! What an amazing outfit! Those boots are so gorgeous! ohh awesome post :) i always love reading your blog! that's a stunning coat btw! I love all the colors you put together in this outfit. Loving your coat! Wow, so bold. Three different patterns and displayed in a non-apologetic manner. Such confidence. I love the coat, the orange looks great on you! What a fun mix of colours and prints! I absolutely love your coat, and although I never would have thought to pair it with anything orange, I love the result! I'd like to cooperate with you. If you're interested in the inquiry, please reply me via eva@joracon.com. 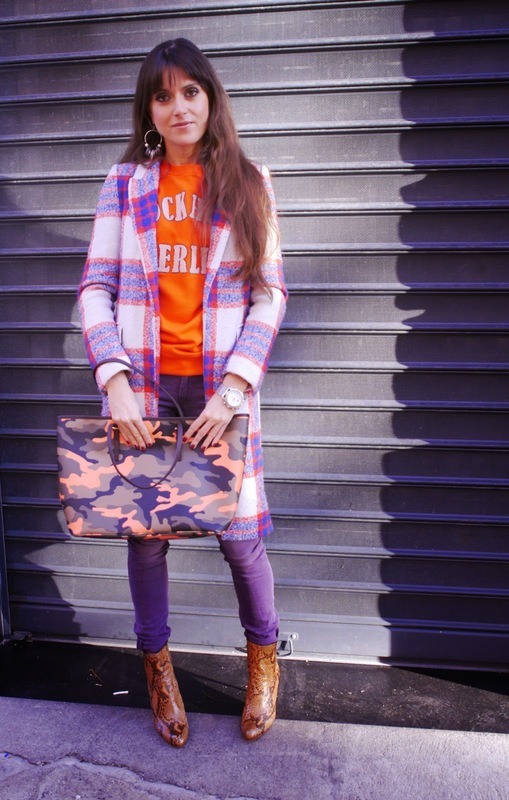 What a super FAB coat - the plaid print is AMAZING!!! Colori fantastici in questo look! Perfect combo with these snake print shoes and purple pants! Great style as always Jeanne! Love this clash of colour! It looks really fun! You do color so well! And obsessed with those boots! I love that you are exploring different colour combinations. I love seeing colour in outfits and it also reminds me of Spring fashions. I love Spring. Your hair looks gorgeous and you look stunning in these photos. Your checked Zara coat looks pretty. Nice outfit, love the MK BAG!! Dear Jeanne, I'm happy to see you today again wearing my favourite coat of your's! And as usual you found a perfect match, how cool to wear the plaid coat with the awesome python booties <3 Wish you a happy rest of the week! Love the jacket and the purse! J'aurais jamais pensé mélanger du violet avec du orange, le résultat est top! the coat is so pretty! :) lovely outfit! Borsa, scarpe e cappottino sono favolosi!!! I am so loving those pants girl. LOVE your coat! So pretty :) And you look great! I am loving it! I need this coat in my life. C très à la Mode !! Très chouette ! !